When I got to the gallery, I was bowled over by the first case, which showed objects from the beginning of the story in the 8th century. 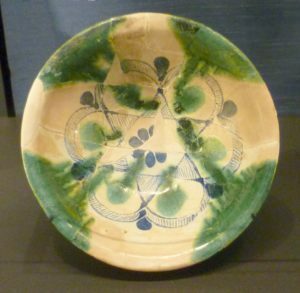 The objects were, actually, fairly ordinary – it was the way they were displayed, and the story they told about travel, trade and the interplay of various traditions which gripped me. 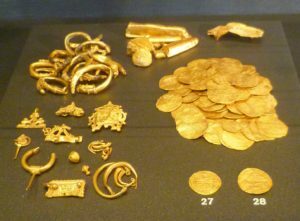 Above is a photograph of what I saw: the objects date from about 800-900 AD and, as you can see, they are not necessarily masterpieces – at least not in their present state. A large pot and lid stand by themselves on the left, and an ivory horn and filigree box hang above, which I couldn’t get into the frame. What I really loved was how carefully the objects were arranged. The green and cream bowl above came from China and it was sitting next to orangey-pink carnelian beads from India, which were next to some bright yellow gold, possibly from Timbuktu in Africa, which was next to pieces of Viking silver at the end of the row. Somehow, that specific juxtaposition of colours, in that particular order, was very pleasing. One – or both – of the curators responsible for the Islamic Gallery obviously had an excellent eye for how colour can add to a display and had gone to a lot of trouble to get it just right. The case I was looking at wasn’t just an informative look at ancient trade routes in the Islamic world, it was a satisfying aesthetic experience as well. As I stood, I became aware of a woman wearing a headscarf standing next to me and we began to talk. She was originally from Algeria, she told me, a country once part of the Roman Empire. We found ourselves agreeing about the benefits of trade and cross-cultural influences. We were looking at a display case which demonstrated how, 1200 years ago, raw materials, luxury goods and ideas had freely crossed continents from China, across Asia, India and the Middle East and even as far north as Scandinavia, and we both felt that the world today badly needed a similar tolerance, understanding and exchange of ideas between its different nations, cultures and religions for trade to flourish. 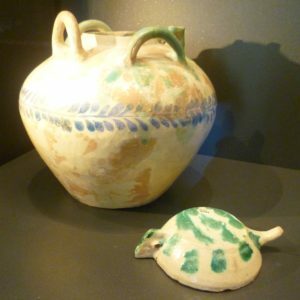 What astonished us was discovering where the objects displayed had originally come from and where they ended up. The pots on the shelves would have held incense and spices; cinnamon and sandalwood from India; star anise from south-east Asia; and dates from Iraq. Raw materials, too, were travelling – rock crystal from Madagascar; carnelian from India; and gold, slaves and elephant ivory from Africa. Potters from Gongyi in China were using blue cobalt from the Middle East to decorate their pots. 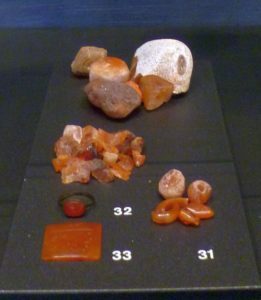 The small pile of carnelian beads was discovered in the port city of Siraf on the Persian Gulf in what is now Iran – a long way from where it originated in India. It was a stone favoured by the Prophet Muhammad and was often set into signet rings as a seal. Amulets were often made of it, too. 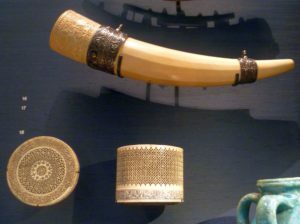 The elephant ivory which, turned into a hunting horn and a cylindrical box, hangs above the objects in the case. The ivory would have arrived in Egypt and Sicily as hollowed out tusks known as ‘oliphants’, probably from the Congo. The horn featured has carved water buffaloes and gazelles in a band circling the top. The French hero, Roland, used an oliphant horn to summon help at the Battle of Roncevalles in the Pyrenees against the Arabs in 778. This horn dates from the 12th century. The ivory box and lid show off the maker’s skill in intricate pierced designs and the Arabic inscription around the base praises an anonymous owner. It was made in Cairo, Egypt or Granada, Spain, in the second half of the 14th century. Vikings traded furs, amber, silver and slaves. Their longships sailed down the River Volga, across the Caspian Sea and thence to Iran where their silver was traded as bullion. 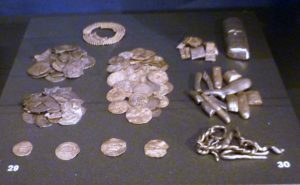 All over the Middle-East, coins were being struck from African gold and Viking silver. The high quality of Islamic gold coinage was known across the Mediterranean and helped to generate wealth and increase trade. Dhows, large sailing vessels, carried luxury objects and raw materials from the Middle East to India, South-East Asia and China. My Medieval historian brother has just pointed out that the quality of Islamic gold coinage was also known well outside the Mediterranean.. Exhibit 45 in the recent Anglo Saxon Kingdoms exhibition at the British Library was a gold coin of King Offa of Mercia (757-796), struck in direct imitation of a contemporary Muslim coin, struck by the caliph Al-Mansur, the founder of Baghdad. The imitation is so close that the coin has the inscription `there is no God but Allah alone’ on the reverse, though it was clearly put there by someone who did not understand it, since it is the wrong way up! However, back to the case. 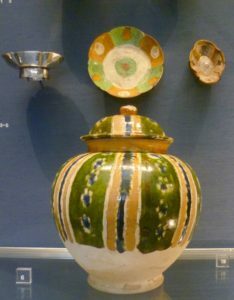 Looking at the top row of the objects, the potsherds show the variety of colours used in pottery at the time, including their favourite green. 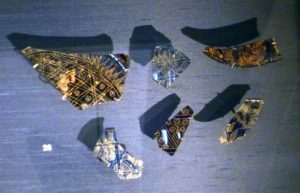 But there is also a superb example of a cobalt blue sherd, found in Siraf, which is beautifully set off by its clever placing immediately above the orangey-pink carnelian beads. Above the gold items hang some terracotta potsherds. 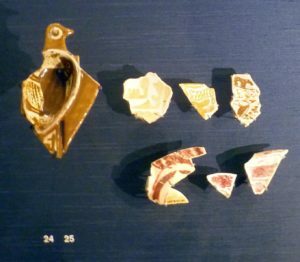 The intriguing bird-shaped one was found in India, and the surrounding sherds come from Sri Lanka. 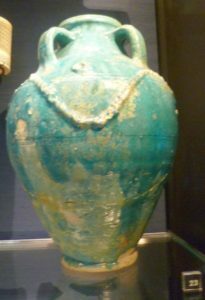 The translucent engraved blue glass pieces were found in Samarra, on the banks of the River Tigris in modern day Iraq. They are beautifully lit – they must have looked spectacular when they were complete. I got the feeling that the constant arrival of raw materials and ideas from across Africa, the Middle East and Asia, and the development of the technical skills needed to exploit the materials’ full potential, all underpinned by high-quality coinage of African gold, made for an exceptionally prosperous and creative period in Islamic history. I spent some considerable time by this one case, chatting to the pleasant and intelligent Algerian woman. When we parted, I felt that somehow our encounter was exactly what the curators were hoping for; a cross-cultural, mutually-respectful interchange. I, certainly, enjoyed it. Finally got caught up with you, Lady H., having read your receent blogs starting with “Mother Christmas” this morning. They are all worthy entries to your oeuvre and, as always, a pleasure to read and contemplate. Thank you, Steve. I hope you and Mary are well. I don’t know why you have given me a title; there are titles in the remoter branches of my family tree – but I have not got one! For me, it was a term of endearment. Like you, but likely much more remotely, I also have royalty in the closet, as my paternal family is reportedly descended from one of the Matildas, c. 1100. Mary and Steve are cruising along, thank you for asking. She just achieved a milestone, completing 20 years working for La Crema Winery (chief chemist), and I, well, I bumble along as best I can, fixing computers, playing music and reading, reading, reading. I have been studying the life of proto-boffin, Sir Arthur Clarke – a hero of my childhood. Also recently completed is Robert Alter’s fascinating new translation, direct from the Hebrew, of the Pentateuch: “The Five Books of Moses.” I read the King James, all of it, last summer. The Alter is a vast and enlightening improvement. Highly recommended. Gosh, Steve! I reviewed a book about a number of early royal Matildas a year or so ago. They were forceful ladies, every one of them. Respect!